For decades, St. George residents have enjoyed the bright, white glow emanating from Dixie State University’s iconic “D” on the black hill. For many, this century-old fixture serves as a warm reminder of our cherished university and collective growth as a community. For some, like Buck Wilkinson, it means even more than that. To Buck, the “D” on the hill represents an important part of his history and treasured experiences growing up in the area. “I spent much of my youth playing around the “D” on the black hill—throwing rocks and just being a kid,” Buck said. Born and raised in St. George, Buck graduated from Dixie College in 1975 and became the second-generation president of Wilkinson Electric, which his dad started 75 years ago. When he was approached last academic year about adding color lights to the “D” on the hill, Buck was happy to help. 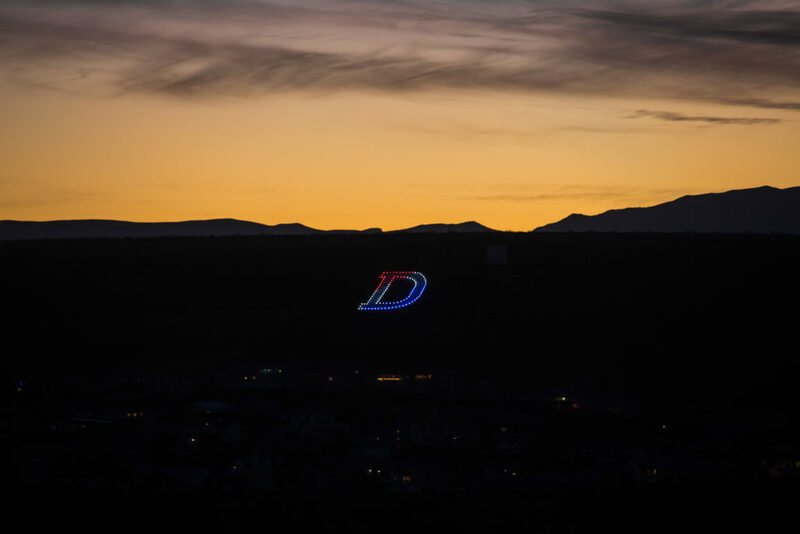 In an effort to engage more students in campus enhancements, the idea to give color to the “D” was generated from Dixie State student leadership and X-Club members. Ezra Hainsworth, Dixie State’s 2017–18 student body president, envisioned a lighting system that could change colors to help showcase the existing “D” and involve students in an initiative that would ultimately reach the entire community. Ezra worked with former X-Club president Tyler Nelson and many other generous and determined Dixie supporters to give the 100-foot tall by 75-foot wide “D” a full-color makeover. They first reached out to Buck at Wilkinson Electric, who donated the labor and some parts, and then involved many others who gave their resources and time to help make this vision a reality. The upgrade included replacing each of the jar light fixtures in the existing structure with fluorescent lights with programmable LED lamps. This new system was wired with a router installed so the lights could be changed remotely. In the past, when Dixie State students wanted a red “D” in celebration of Homecoming or D-Week, they had to physically trudge up to the “D” and manually place a red bag over each of the 150 individual lights. Now, thanks to technology and a committed group of “D” devotees, colors can change from anywhere at the mere push of a button. “D” lights will change for the special occasions most well known and celebrated by local residents, such as New Year’s Day, Independence Day, Thanksgiving, and Christmas. Lights will also match with the University Clock Tower in the center of the DSU Campus. 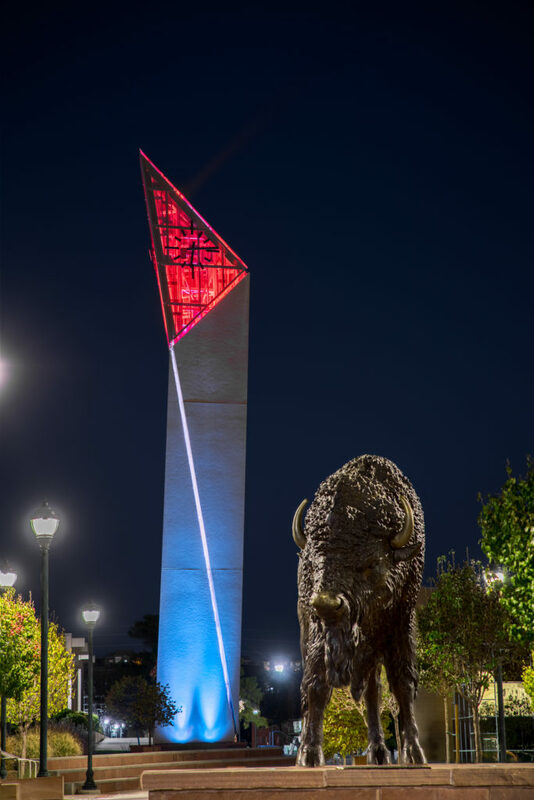 In addition, “D” light colors will change to alert community members about key DSU events, including the first day of the fall and spring semesters, homecoming week, D-Week, commencement, and home football and basketball victories. Now, every day at 5 a.m. when Buck goes out for his morning walk, he looks up at the glowing “D” that has watched over him throughout his life’s journey here and takes pride in being part of all that it represents. As we delve into this new year, reflecting on the past and looking forward to the promise of what’s to come, join us in admiring Dixie State University’s colorful “D” on the black hill, and know, with every certainty, that the future is bright! For a full schedule of the “D” light colors and other details, visit dixie.edu/Dlights.